AM is a fundamentally new way of building objects. It works similarly to the way Nature works, by gradually adding small amounts of material to build structures of almost infinite complexity. This is a game changer in the way we build things. Just like Nature is incredibly efficient both in terms of energy and material use, AM can help us build objects in a much more sustainable manner. Because complexity is essentially free, we can add functionality to objects at close to zero marginal cost. I believe, because of this, AM will have an impact on our future, that is bigger than the invention of the microchip. For the past decades, AM has primarily been used for prototyping. This has helped us bring products to market faster, but it has also held us back, because we could not take advantage of the unique capabilities of AM, namely the building of objects, that cannot be produced using conventional processes. In recent years, the production of end-use parts has picked up and slowly people are exploring the unique qualities of the AM process. Now it’s up to the tools that feed the printers to evolve, so that new designs can be created. This is what we are doing at Hyperganic. On the material side, great progress has been made. The one critical area that needs to evolve is multi-material printing involving metals. Once we can print metals reliably in a mixed workflow with insulating materials, the entire realm of electromechanical devices will open up. Printing of electric motors and actuators will be a complete gamechanger, because this functionality can be included in objects, essentially for free. DfAM will have the biggest impact, once objects are not regarded as individual parts, but as components in a larger context. Once we optimize entire substructures and machines, we can truly take advantage of the capabilities of the 3D printers to produce integrated functional objects. Designers and Engineers are used to simplifying things and breaking machinery into separate parts that are then looked at individually. Startups looking at one particular sector of an industry and departments in large corporations may not “see the forest for the trees”; interdisciplinary and cross-functional thinking is essential, when working with AM. To me AM is a unique opportunity to work on a really fundamental shift in the way we build things. The opportunity, to me, can only be compared to the start of the microchip industry 60 years ago. There, computers went from big electromechanical devices to small silicon wafers with “printed” functionality. 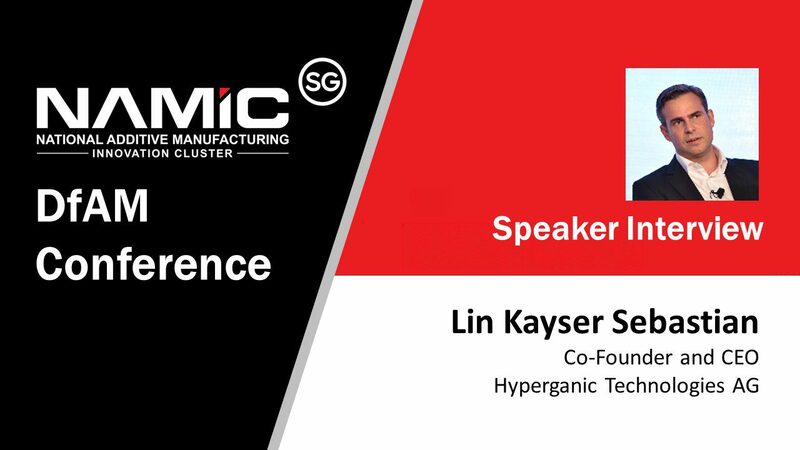 I foresee this shift happening in the general world of manufacturing now and it is an absolute honor and thrill, to be able to help drive this change with Hyperganic. The key to DfAM is functional integration. Moving away from separate parts to objects that contain a number of functions. One of the most exciting fields we have been working on is the Space industry. 3D printed rocket engines are the norm in any modern orbital launcher. These engines have unique geometric shapes that cannot be manufactured using traditional processes. At Hyperganic, we are working on translating the design rules into algorithms to completely “grow” these objects from scratch, using a process of Digital Evolution.